HAMR-E uses electro-adhesive pads on its feet and a special gait pattern to climb on vertical, inverted, and curved surfaces, like the inside of this jet engine. Photo courtesy of Wyss Institute at Harvard University. (CAMBRIDGE, Mass.) — Jet engines can have up to 25,000 individual parts, making regular maintenance a tedious task that can take over a month per engine. Many components are located deep inside the engine and cannot be inspected without taking the machine apart, adding time and costs to maintenance. This problem is not only confined to jet engines, either; many complicated, expensive machines like construction equipment, generators, and scientific instruments require large investments of time and money to inspect and maintain. 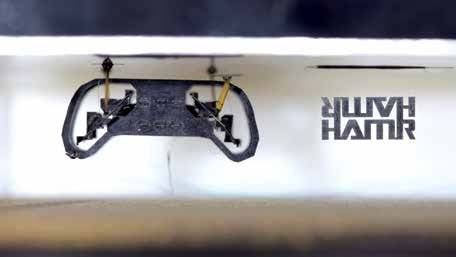 Researchers at Harvard University’s Wyss Institute for Biologically Inspired Engineering and John A. Paulson School of Engineering and Applied Sciences (SEAS) have created a micro-robot whose electro-adhesive foot pads, origami ankle joints, and specially engineered walking gait allow it to climb on vertical and upside-down conductive surfaces, like the inside walls of a commercial jet engine. The work is reported in Science Robotics. HAMR-E, created in collaboration with Rolls-Royce, is a micro-robot that uses electro-adhesion to scale vertical, inverted, and curved surfaces, allowing it to explore spaces that are too small for humans. HAMR-E could one day be used to inspect jet engines and other complicated machines without requiring them to be taken apart. Photo courtesy of Wyss Institute at Harvard University. 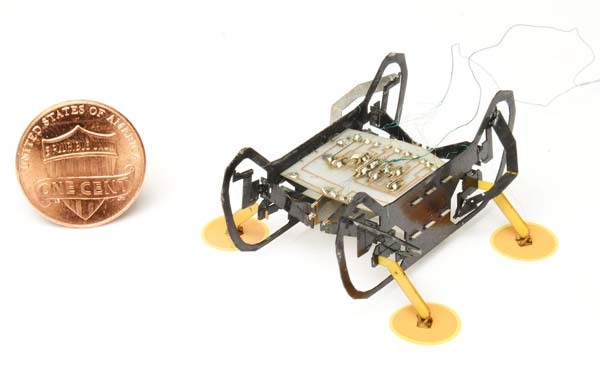 The new robot, called HAMR-E (Harvard Ambulatory Micro-Robot with Electro-adhesion), was developed in response to a challenge issued to the Harvard Microrobotics Lab by Rolls-Royce, which asked if it would be possible to design and build an army of micro-robots capable of climbing inside parts of its jet engines that are inaccessible to human workers. 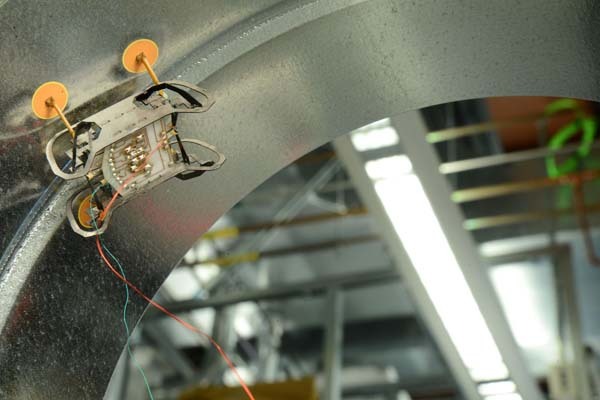 Existing climbing robots can tackle vertical surfaces, but experience problems when trying to climb upside-down, as they require a large amount of adhesive force to prevent them from falling. First, they needed to create adhesive foot pads that would keep the robot attached to the surface even when upside-down, but also release to allow the robot to “walk” by lifting and placing its feet. The pads consist of a polyimide-insulated copper electrode, which enables the generation of electrostatic forces between the pads and the underlying conductive surface. The foot pads can be easily released and re-engaged by switching the electric field on and off, which operates at a voltage similar to that required to move the robot’s legs, thus requiring very little additional power. HAMR-E is small but mighty and could one day carry instruments and cameras to inspect small spaces. Photo courtesy of Wyss Institute at Harvard University. The electro-adhesive foot pads can generate shear forces of 5.56 grams and normal forces of 6.20 grams—more than enough to keep the 1.48-gram robot from sliding down or falling off its climbing surface. In addition to providing high adhesive forces, the pads were designed to be able to flex, thus allowing the robot to climb on curved or uneven surfaces. Finally, the researchers created a special walking pattern for HAMR-E, as it needs to have three footpads touching a vertical or inverted surface at all times to prevent it from falling or sliding off. One foot releases from the surface, swings forward, and reattaches while the remaining three feet stay attached to the surface. At the same time, a small amount of torque is applied by the foot diagonally across from the lifted foot to keep the robot from moving away from the climbing surface during the leg-swinging phase. This process is repeated for the three other legs to create a full walking cycle and is synchronized with the pattern of electric field switching on each foot. HAMR-E also successfully maneuvered around a curved, inverted section of a jet engine while staying attached, and its passive ankle joints and adhesive foot pads were able to accommodate the rough and uneven features of the engine surface simply by increasing the electro-adhesion voltage. The robot’s electro-adhesive foot pads can generate shear forces of 5.56 grams and normal forces of 6.20 grams–more than enough to keep the 1.48-gram robot from sliding down or falling off its climbing surface. 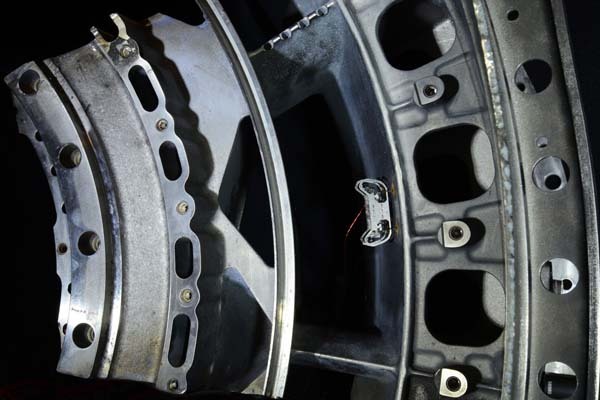 In addition to providing high adhesive forces, the pads were designed to be able to flex, thus allowing the robot to climb on curved or uneven surfaces. Photo courtesy of Wyss Institute at Harvard University. The team is continuing to refine HAMR-E and plans to incorporate sensors into its legs that can detect and compensate for detached foot pads, which will help prevent it from falling off vertical or inverted surfaces. HAMR-E’s payload capacity is also greater than its own weight, opening the possibility of carrying a power supply and other electronics and sensors to inspect various environments. The team is also exploring options for using HAMR-E on non-conductive surfaces. “This iteration of HAMR-E is the first and most convincing step towards showing that this approach to a centimeter-scale climbing robot is possible, and that such robots could in the future be used to explore any sort of infrastructure, including buildings, pipes, engines, generators, and more,” said corresponding author Robert Wood, Ph.D., who is a founding core faculty member of the Wyss Institute, as well as the Charles River Professor of Engineering and Applied Sciences at SEAS. The Wyss Institute for Biologically Inspired Engineering at Harvard University (http://wyss.harvard.edu) uses nature’s design principles to develop bioinspired materials and devices that will transform medicine and create a more sustainable world. Wyss researchers are developing innovative new engineering solutions for healthcare, energy, architecture, robotics, and manufacturing that are translated into commercial products and therapies through collaborations with clinical investigators, corporate alliances, and formation of new startups. The Wyss Institute creates transformative technological breakthroughs by engaging in high risk research, and crosses disciplinary and institutional barriers, working as an alliance that includes Harvard’s Schools of Medicine, Engineering, Arts & Sciences and Design, and in partnership with Beth Israel Deaconess Medical Center, Brigham and Women’s Hospital, Boston Children’s Hospital, Dana–Farber Cancer Institute, Massachusetts General Hospital, the University of Massachusetts Medical School, Spaulding Rehabilitation Hospital, Boston University, Tufts University, Charité – Universitätsmedizin Berlin, University of Zurich and Massachusetts Institute of Technology. Lindsay Brownell is a science writer for the Wyss Institute for Biologically Inspired Engineering at Harvard University.